This article is about the shipping company. For the manufacturer, see Dorel Industries. Not to be confused with Costco, Cosco (India) Limited, Cusco, or CUSCO Japan. 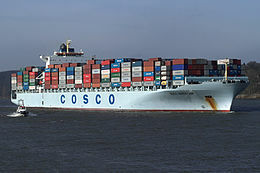 China Ocean Shipping (Group) Company (Chinese: 中国远洋运输（集团）总公司), known as COSCO or COSCO Group, is a Chinese state-owned shipping and logistics services supplier company. 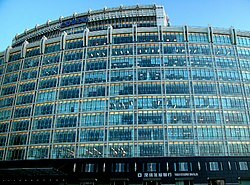 Its headquarters is in Ocean Plaza in the Xicheng District in Beijing. It owns 1114 ships, including 365 dry bulk vessels, a container fleet with a capacity of 1,580,000 twenty-foot equivalent units (TEU), and a tanker fleet of 120 vessels. The fleet calls at over a thousand ports worldwide. It ranks third largest in both number of container ships and aggregate container volume in the world. In 2012, it was among China's top 15 brands. It is the largest dry bulk carrier in China and one of the largest dry bulk shipping operators worldwide. 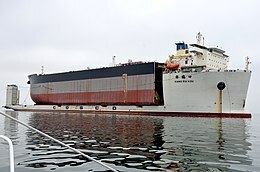 In addition, the Group is the largest liner carrier in China. A list of the ships it operates can be found at COSCO fleet lists. In February 2016, the COSCO Group merged with China Shipping Group to form China COSCO Shipping. COSCO contains seven listed companies and has more than 300 subsidiaries locally and abroad, providing services in freight forwarding, ship building, ship repair, terminal operation, container manufacturing, trade, financing, real estate, and information technology. Hong Kong: COSCO Pacific Ltd.
Hong Kong: COSCO International Holdings Ltd.
Shenzhen: China International Marine Containers (Group) Co. Ltd.
Japan: Cosco SHIPPING Lines (Japan) Co., Ltd. In April 2016 COSCO agreed to buy 51% of Piraeus Port Authority, which is listed on the Athens Stock Exchange (Athex: PPA) and is a constituent of the FTSE/Athex Large Cap index. COSCO's subsidiary Piraeus Container Terminal (PCT) has been operating two Piers at Piraeus Port since 2009. In July 2017, COSCO put in a $6.3 billion bid to buy its Hong Kong based rival Orient Overseas (International) Limited. The bid has been accepted subject to shareholder and regulatory approval. This will make it the world's third largest container shipping company with a fleet of over 400 vessels. On 31 July 2009, the Panama-flagged bulk carrier, Full City, operated by COSCO, experienced engine failure and ran aground near Langesund, Telemark, Norway, during a storm, spilling 200 tons of heavy bunker fuel oil in an ecologically and environmentally sensitive wildlife area. On the 3 April 2010 MV Shen Neng 1 ran aground approximately 38 nautical miles (70 km; 44 mi) east of Great Keppel Island, Australia. The ship, which was carrying 975 tonnes of heavy bunker fuel oil, began leaking oil in the Great Barrier Reef Marine Park, which is closed to commercial shipping (it had been 15 nautical miles (28 km; 17 mi) off course). The Australian Maritime Safety Authority has revealed that a shipping plan was lodged for Shen Neng 1 to travel between Douglas Shoal and the Capricorn Group, where there is a gap of 6 nautical miles (11 km; 6.9 mi). ^ "China Ocean Shipping Group Co". Bloomberg. Retrieved 14 March 2013. ^ "Contact Us Archived 2010-01-30 at the Wayback Machine." COSCO. ^ "Donation Archived 2011-07-27 at the Wayback Machine". COSCO. May 21, 2008. ^ "China Cosco Shipping Group Profile". Retrieved 4 August 2017. ^ "Alphaliner TOP 100". January 2019. ^ "China Ocean Shipping (Group) Company Company Profile". Yahoo Business. Retrieved 18 March 2013. ^ "Fleet". COSCO Group. Archived from the original on 29 March 2010. Retrieved 4 April 2010. ^ a b "Greek president hopes for more investments following Piraeus Port Authority deal". Hellenic Shipping News. 11 April 2016. Retrieved 13 April 2016. ^ "China shipping firm Cosco to buy HK rival OOIL for $6.3bn". BBC News. Retrieved 10 July 2017. ^ Wojciech Moskwa (3 August 2009). "Norway police charge ship captain after fuel spill". Reuters. Retrieved 16 May 2010. ^ Department of Transport and Main Roads (1 June 2010). "Great Barrier Reef Grounding". Queensland Government. Archived from the original on April 7, 2010. Retrieved 4 June 2010. ^ Aarthun, Sarah (5 April 2010). "Official: Ship aground near Great Barrier Reef was off course". CNN. Retrieved 12 October 2012. ^ "Oil Spill Ship Took Legal Reef Route". ABC News. 6 April 2010. Retrieved 16 May 2010. 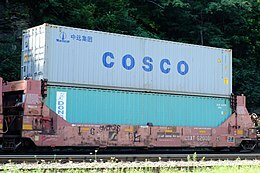 Wikimedia Commons has media related to COSCO.